Not to be confused with Ireland men's national rugby league team. This article is about the men's team. For the women's team, see Ireland women's national rugby union team. The Ireland national rugby union team represents the island of Ireland (including both the Republic of Ireland and Nothern Ireland) in rugby union. They are ranked third in the world by World Rugby as of 18 March 2019. The team competes annually in the current Six Nations Championship, which they have won fourteen times outright and shared nine times in its various formats. The team also competes every four years in the Rugby World Cup, where they reached the quarter-final stage in all but two competitions (1999 and 2007). Ireland is also one of the four unions that make up the British and Irish Lions – players eligible to play for Ireland are also eligible for the Lions. The Ireland national team dates to 1875, when it played its first international match against England. Ireland's highest ever position in the World Rugby Rankings is second, which they reached for the first time in 2015. Eleven former Ireland players have earned induction into the World Rugby Hall of Fame. Dublin University was the first organised rugby football club in Ireland, having been founded in 1854. The club was organised by students who had learnt the game while at public schools in Great Britain. During the third quarter of the nineteenth century, and following the adoption of a set of official rules in 1868, rugby football began to spread quickly throughout Ireland, resulting in the formation of several other clubs which are still in existence, including NIFC (1868); Wanderers (1869); Queen's University (1869); Lansdowne (1873); Dungannon (1873); Co. Carlow (1873); UCC (1874); and Ballinasloe (1875) which amalgamated with Athlone to form Buccaneers. In 1874, the Irish Football Union (reconstituted as the Irish Rugby Football Union after unification with the North of Ireland Union) was formed. Ireland lost their first test match against England 7–0 at the Oval on 15 February 1875. Both teams fielded 20 players in this match, as was customary in the early years of rugby union; it was not until 1877 that the number of players was reduced from 20 to 15. Ireland's first home game was also against England in the same year held at Leinster Cricket Club's Observatory Lane ground in Rathmines as Lansdowne Road was deemed unsuitable. The first match at Lansdowne Road was held on 11 March 1878, with England beating Ireland by 2 goals and 1 try to nil. It was not until 1881 that Ireland first won a test, beating Scotland at Ormeau in Belfast. Ireland turned up two men short for their game in Cardiff in 1884 and had to borrow two Welsh players. The first victory Ireland had at Lansdowne Road took place on 5 February 1887. It was also their first win over England, by two goals to nil. On the third of March 1888, Ireland recorded their first win over Wales with a goal, a try and a drop goal to nil. In 1894, Ireland followed the Welsh model of using seven backs instead of six for the first time. After victory over England at Blackheath, Ireland won back-to-back matches for the first time when recording their first win over Scotland on 24 February 1894. Ireland went on to beat Wales in Belfast and win the Triple Crown for the first time. In the 1890s, Rugby was primarily a game for the Protestant middle class, the only Catholic in Edmund Forrest's 1894 team was Tom Crean. Of the eighteen players used in the three games, thirteen were from three Dublin clubs – Wanderers, Dublin University and Bective Rangers – and the remaining five were from Ulster. They went on to win the Home international championship twice more before the old century was out (1896 and 1899), so that by 1901 all four of the Home Unions had tasted success at a game that was growing in popularity with players and spectators. Such was the level of interest in the visit of the first All Blacks team to Dublin in November 1905 that the IRFU made the match the first all-ticket rugby international in history. Ireland played only seven forwards, copying the then New Zealand method of playing a "rover". The game ended New Zealand 15 Ireland 0. 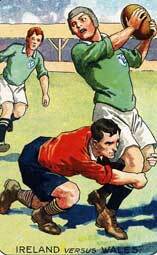 On 20 March 1909, Ireland played France for the first time, beating them 19–8. This was Ireland's biggest victory in international rugby at that time, their highest points tally and a record five tries. 30 November 1912 was the first time the Springboks met Ireland at Lansdowne Road, the 1906 tour game having been played at Ravenhill. Ireland with seven new caps were overwhelmed by a record margin of 38–0, still a record loss to South Africa who scored 10 tries. In 1926, Ireland went into their final Five Nations match unbeaten and with the Grand Slam at stake lost to Wales in Swansea. Ireland again came close to a grand slam in 1927 when their sole loss was an 8–6 defeat by England. In 1948, Ireland clinched their first Grand Slam in the Five Nations. Ireland were champions and Triple Crown winners again in 1949. In 1951, Ireland were once more crowned Five Nations champions. 1952 saw only Ireland's second overseas tour, the first for over half a century – as they headed to Argentina for a nine-match trip which included two test matches, their Test record being won one, drawn one. On 27 February 1954, Ireland played Scotland at Ravenhill in Belfast. The 11 Republic-based players protested "God Save the Queen", and an abbreviated anthem known as "the Salute" was instead played. Ireland beat Scotland 6–0, and did not play in Northern Ireland again until 2007. In 1958, Ireland beat Australia 9–6 in Dublin, the first time a major touring team had been defeated. Ireland managed just three victories in the Five Nations Championship during the early 1960s: against England in 1961, Wales in 1963 and England again in 1964. 1965 saw an improvement as Ireland beat England and Scotland. On 10 April 1965 at Lansdowne Road Ireland recorded their first ever win over South Africa. Ireland beat Australia again in Dublin in 1967. Ireland became the first of the home nations to win in the Southern Hemisphere when they beat Australia in Sydney in May 1967. On 26 October 1968, Ireland made it four successive wins over the Wallabies. In 1969, Ireland claimed a 17–9 victory over France in the Five Nations, a first victory over Les Bleus in 11 years. In the autumn of 1969, the Irish Rugby Football Union appointed a coach for the national team for the first time, the role went to Ronnie Dawson. The 1972 Five Nations Championship was not completed when Scotland and Wales refused to play in Ireland following threatening letters to players, purportedly from the IRA. The championship remained unresolved with Wales and Ireland unbeaten. In 1973, despite similar threats, England fulfilled their fixture and were given a five-minute standing ovation. Ireland won 18–9. Ireland came close to a first win over the All Blacks on 20 January 1973, but tied 10–10. In 1974, Ireland won their first Five Nations Championship since 1951. Willie John McBride was coach until 1984. In 1982, Ireland, led by fly-half Ollie Campbell, win the Five Nations and their first Triple Crown in 33 years. Three years later in 1985, Ireland won the Five Nations and the Triple Crown again. It would be Ireland's last silverware until 2004. Ireland scored 10 tries against Romania in a 60–0 win on 1 November 1986, the biggest win by a Tier One country in international rugby at the time, equalling the French record set in 1967. At the inaugural 1987 Rugby World Cup, victories over Tonga and Canada saw Ireland through to the quarter-finals, where they were beaten 33–15 by joint hosts Australia. Ireland failed to win the Five Nations in the whole of the 1990s, never finishing outside the bottom two. In 1991, they lost their test series against Namibia. At the second Rugby World Cup in 1991, after wins over Japan and Zimbabwe, Ireland lost 24–15 at Murrayfield. Ireland played the Wallabies at Lansdowne Road in the quarter final and appeared to be on the verge of a shock victory over Australia, when Michael Lynagh scored the winning try to clinch a 19–18 win for Australia. At the 1994 Five Nations Championship, Ireland beat England at Twickenham. At the 1995 World Cup, Ireland came through their group to make their third consecutive quarter-final appearance. Unfortunately, France proved too strong, with Ireland going down 36–12 in the quarter finals. The start of the professional era was disappointing for Ireland, who finished bottom of the Five Nations Championship three years in succession (1996, 1997 and 1998) and lost to Italy thrice, at home(29-37) and abroad (22-12 and 37-22) . Warren Gatland took over as coach in 1998, but was unable to produce immediate success. The 1999 World Cup was staged primarily in Wales, though Ireland played all their pool games in Dublin. In a play-off, Ireland were beaten 28–24 by Argentina, marking the first time that Ireland failed to reach the quarter finals. From this nadir, however, Irish rugby improved. The Irish Rugby Football Union converted the four representative provincial sides into de facto club sides, and the formation in 2001 of the Celtic League (now called the Pro14) provided Irish provincial sides with regular competitive rugby. The advent of the new Six Nations format coincided with this Irish resurgence. In 2001, Ireland finished second. Eddie O'Sullivan took over as coach in November 2001 after Warren Gatland was sacked. The 2003 Six Nations Championship saw Ireland lose to England in the Grand Slam decider at Lansdowne Road, ending a home unbeaten run that stretched to 10 tests since September 2002. In the 2004 Six Nations, Ireland finished second overall and won the Triple Crown. In the 2005 Six Nations, Ireland finished in third place. In the 2006 Six Nations, Ireland won the Triple Crown for the second time in three years. In the last autumn international at Lansdowne Road, Ireland beat Australia 21–6. With the rebuilding of Lansdowne Road, a new venue was required. Croke Park, home of the Gaelic Athletic Association, hosted some games from 2007 to 2010. Ireland's 2008 Six Nations campaign included three losses. Eddie O'Sullivan resigned as Ireland coach and Declan Kidney was appointed. 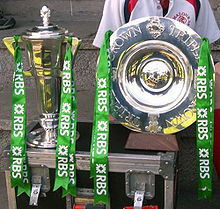 Brian O'Driscoll lifts the 2009 Six Nations Grand slam trophy. Ireland won the 2009 Six Nations Championship and Grand Slam, their first Six Nations win since 1985 and their first Grand Slam since 1948. After a draw against Australia and victories against Fiji and South Africa, Ireland ended 2009 unbeaten. In Ireland's final game of the 2010 Six Nations, and the last-ever game at Croke Park, Ireland lost to Scotland 20–23 and failed to win the Triple Crown. Ireland began their 2010 Autumn Tests with a 21–23 loss to South Africa, the first international at the new Aviva Stadium. In the 2011 Six Nations Championship, Ireland lost 22–25 to France in the first Six Nations match to be played at the Aviva Stadium. During a 13–19 loss against Wales, Ireland's Ronan O'Gara became the first Irishman, and only the fifth player, to score 1,000-points. In Ireland's 24–8 win against England, Brian O'Driscoll scored his 25th try to set a new Six Nations record for tries scored. In their 2012 Six Nations Championship campaign Ireland finished third overall. Ireland's 2012 summer tour of New Zealand included a 22–19 loss, followed by a 60–0 thrashing, Ireland's heaviest ever defeat. Ireland celebrate their 2014 Six Nations Championship. The 2013 Six Nations Championship saw Ireland finish with one win, three losses, and one draw, including their first home loss to England in 10 years; and their first ever loss to Italy in the Six Nations. The IRFU declined to extend Declan Kidney's contract, and Joe Schmidt was announced as the new Ireland coach. In their 2013 end-of-year rugby union tests, Ireland lost 22–24 to New Zealand, having led throughout the match. Ireland opened their 2014 Six Nations Championship with wins over Scotland and Wales. Ireland lost 10–13 to England. Ireland won their next match against Italy 46–7. Ireland beat France 22–20 in the final round to claim the Six Nations title. In November they defeated South Africa 29–15 and Australia 26–23 at Dublin. Ireland retained the 2015 Six Nations Championship, and became Six Nations Champions for the second year running on points difference. Following wins against Wales and Scotland during warm-up matches for the 2015 Rugby World Cup, Ireland briefly reached its highest-ever position of second in the World Rugby rankings. Ireland won its pool at the 2015 Rugby World Cup with a 24–9 victory over France, but lost in the quarterfinals to Argentina 20–43. Entering the 2016 Six Nations competition with a squad depleted by injury, Ireland won only two matches in the tournament (58-15 against Italy in Round 4, and 35-25 against Scotland in Round 5), and only achieved a 16-16 draw against Wales. The team went on the win the first of their three-match tour of South Africa 26-20, before losing the second and third tests 32-26 and 19-13. In autumn of the same year, Ireland defeated the New Zealand All Blacks for the first time in 111 years on 5 November 2016 in Chicago by 40–29. This was New Zealand's only loss all year, and ended their record-breaking win streak of 18 test matches. Despite New Zeland winning the return fixture in Dublin the following week 21-9, Ireland moved up to number 4 in the World Rankings. Ireland placed second in the 2017 Six Nations, behind defending champions England, who the Irish defeated in the final of round of the competition by 13-9, ending England's record-equalling run of 18 victories since 2015. Their only loss of the championship was to Scotland, by 27-22 in Round 1. With many first-choice players selected to tour with the British and Irish Lions, Ireland took a development squad into their summer games that year, which included a 55-19 win over the USA, and a 2/2 test series victory against Japan. In November 2017, Ireland moved to number 3 in World Rankings following their biggest ever win over South Africa, 38-3, and victories over Fiji and Argentina. After winning the 2018 Six Nations Championship with a Grand Slam, Ireland moved to number 2 in the world rankings again. A 2-1 series win over Australia in summer that year was followed by a second victory in two years against the world number one All Blacks, by 16-9 which cemented Ireland's number two ranking. The 2019 Six Nations witnessed a shocking collapse in form for the defending champions. The year started with a one-sided defeat to England, by 20-32. The final scoreline flattered the Irish performance, which was comprehensively poor relative to the standard of previous years. Some redemption followed with patchy wins against Scotland, Italy and France, but the competition concluded with a completely abject display against Grand Slam winners Wales by 25-7. The Welsh had led the Irish by 25-0 going into overtime, but a last-gasp try to replacement half-back Jordan Larmour salvaged some points from an otherwise disastrous showing. Ireland's traditional strip consists of a green jersey, white shorts, and green socks. Their emblem consists of a shamrock and rugby ball; a shamrock has been incorporated into the emblem since the side first played in 1874. Between 1996 and the summer of 2002, Ireland's main shirt sponsor was Irish Permanent who became Permanent TSB after a merger, who continued to sponsor the shirt until the autumn of 2006. O2 were Ireland's main shirt sponsor from then until 2014. 3 were the sponsors of the team up until the summer of 2016 where Vodafone then became the main sponsor. Before 1992, Umbro supplied kit to Ireland. Nike were the suppliers between 1992 and the summer of 2000. Canterbury of New Zealand took over after the summer of 2000 and was the supplier until June 2009. In November 2009, Puma took on the supply of Ireland's playing and training kit. In January 2014, Canterbury and the IRFU signed a deal which will see Canterbury supply Ireland's playing and training kit from November 2014 until 2020. * Between 1996 and summer 2000, it was known as Irish Permanent before reverting to Permanent TSB before the sponsorship ended in summer 2006. The Irish rugby union team is one of many teams that draws its players from across the island of Ireland. In the past this has led to issues surrounding certain flag and anthem usage. When Irish internationals were played alternately in Belfast and Dublin, the British national anthem "God Save the Queen" was played before matches in Belfast and the national anthem of Ireland "Amhrán na bhFiann" was played for matches in Dublin. "God Save the Queen" is no longer played as some Irish players refused to stand for it. No anthem was played at away games. In the 1987 Rugby World Cup, "The Rose of Tralee" was used as the away anthem. Since April 1995, a specifically composed anthem named "Ireland's Call" has been used exclusively by the Irish team at away games. This has prompted some players and supporter complaints that "Amhrán na bhFiann" should also be played. At games played in Dublin "Ireland's Call" is always used alongside "Amhrán na bhFiann". This use of "Amhrán na bhFiann" has caused similar complaints from players and supporters within a segment of the unionist community in Northern Ireland. With Ireland's test match against Italy in the run up to the 2007 Rugby World Cup scheduled to be held in Belfast (first time since 1953 for the rugby union team), there were calls for "God Save the Queen" to be used alongside "Ireland's Call" but this was turned down by the IRFU with the explanation given that both "Ireland's Call" and "Amhrán na bhFiann" are only played together in Dublin, and that outside the Irish Republic the anthem of "Ireland's Call" is exclusively used. At the 2011 Rugby World Cup and 2015 Rugby World Cup, the Ireland team entered the field of play at the beginning of their matches with the Irish tricolour and the Flag of Ulster, to which the six Irish counties in Northern Ireland belong. The traditional home of Irish rugby is Lansdowne Road in Dublin, where most of Ireland's home matches were held. The stadium was rebuilt between 2007 and 2010. Naming rights were sold to an insurance company, and the venue is now referred to as the Aviva Stadium. The original stadium, owned by the Irish Rugby Football Union, was built in 1872, and so the venue continues to hold the distinction as the oldest still in use for international rugby. In 1878 the ground hosted its first rugby Test, with Ireland playing host to the English (the first representative rugby match had taken place prior to the Test, a game between Ulster and Leinster). Lansdowne Road had a capacity of just over 49,000 before it was demolished in summer 2007. The redeveloped stadium seats 51,700 and was opened in May 2010. The final Irish Test prior to work commencing on the remodelled stadium was against the Pacific Islanders in late 2006. With Lansdowne Road unavailable for use, Ireland was without a suitable home ground for the subsequent Six Nations. 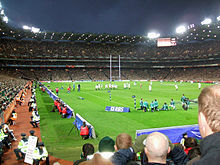 The Gaelic Athletic Association (GAA) owned Croke Park (an 82,500 capacity stadium), was made available for Ireland's two home games against France and England in 2007. It was the first time ever that rugby had been played at the venue. Croke Park remained in use for Ireland's Six Nations matches and other major Tests until the completion of the redevelopment at Lansdowne Road. The first Ireland match at the rebuilt stadium was against reigning World Cup champions South Africa on 6 November 2010. South Africa won the match 23–22. Because of the historic significance of this match, South Africa announced that they would wear their change strip to allow Ireland to wear their home green; normally, the home team change their colours in the event of a clash. Although Ireland has never totally hosted the Rugby World Cup, select games from both the 1991 and 1999 World Cups were played throughout venues in Ireland. Pool B in 1991 was mainly played in Ireland and Scotland, with two games at Lansdowne Road (involving Ireland) and one (Zimbabwe v Japan) played at Ravenhill, Belfast. A quarter-final and a semi-final were also hosted by Dublin. A similar system was used in 1999, though in addition to Lansdowne and Ravenhill, Thomond Park was also a venue. Lansdowne Road was also the host of a quarter-final in 1999. Ireland were set to host matches at Lansdowne Road for the 2007 World Cup, but due to scheduling conflicts with the reconstruction of the stadium, they decided they were not in a position to host any. The Six Nations Championship, held every year in February and March, is Ireland's only annual tournament. It is contested against England, France, Italy, Scotland and Wales. Ireland was a member of the inaugural Home Nations in 1883, with France and Italy joining later to form the Five and Six Nations respectively. Ireland won their first championship in 1894, also winning the Triple Crown. Ireland's first Grand Slam occurred in the 1948 season and their second in the 2009 season. In total Ireland have been outright champions on fourteen occasions following their title in the 2018 Six Nations Championship and have nine shared wins. Ireland won their third ever Grand Slam in the 2018 Six Nations Championship with a 15-24 win over England at Twickenham on March 17 (St Patrick's Day). Ireland have competed at every Rugby World Cup tournament. The furthest they have progressed is the quarter-finals, which they have made six times out of eight. They have finished top of their pool twice, in 2011, after beating pool favourite Australia, and in 2015 leaving France in 2nd place. In the first tournament, held in Australia and New Zealand in 1987, Ireland finished second in their pool after a loss to Wales, before Ireland were knocked out by Australia in the quarter final in Sydney. In 1991 Ireland again lost one match in pool play, this time to Scotland. Ireland again met Australia in the quarter-finals, losing by one point. In 1995 Ireland were runner-up in their pool to the All Blacks. Ireland were defeated by France in their quarter-final in Durban. In 1999 Ireland finished second in their pool behind Australia, and went into the quarter-final play-offs (a system exclusive to the 1999 tournament). There they lost to Argentina, and thus, not being a quarter-finalists, Ireland were not given automatic entry into the 2003 tournament. In qualifying matches, Ireland defeated Russia and Georgia to advance to the 2003 tournament. Ireland finished second to Australia in their pool, and were knocked out by France in the quarter finals. In the 2007 World Cup Ireland played in the so-called "Group of death" with hosts France, Argentina, Namibia and Georgia. Ireland defeated Namibia in their opening game 32–17. Their progress was then put into doubt when they beat Georgia 14–10, not obtaining a bonus point. Ireland lost to France 25–3. Entering their last group match against Argentina, needing four tries to secure a bonus point without allowing Argentina anything, Ireland were defeated 30-15 and crashed out at the pool stage for the first time. Ireland were in Pool C for the 2011 Rugby World Cup with Australia, Russia, USA and Italy. Their first pool game was against the US, which ended in a 22–10 victory for Ireland. Ireland's second pool game was against Australia. Despite being underdogs, Ireland recorded their first victory over Australia at a World Cup with a 15–6 win. Ireland comfortably beat Russia 62–12 in their third pool game. Ireland secured first place in the pool with a 36–6 win over Italy, the first time that Ireland were group winners in their World Cup history. Ireland lost their quarter final to Wales 10–22. Ireland topped Pool D of the 2015 Rugby World Cup with four victories, two with bonus points. They kicked off their campaign with a 50-7 win over Canada. Another bonus point victory followed in front of a world record Rugby World Cup crowd of 89,267 at the home of England football, Wembley Stadium, when Ireland saw off Romania 44-10. Ireland then faced Italy, coming out on top 16-9, the only try coming from Keith Earls who surpassed Brian O'Driscoll as Ireland's leading Rugby World Cup try scorer with eight. The final pool game saw Ireland face France. The winner would set up a quarter final against Argentina and avoid the All Blacks. Ireland overcame the loss to injury of key players Jonathan Sexton, Peter O'Mahony and Paul O'Connell to run out 24-9 winners. The victory set up another game for Ireland in the Millennium Stadium against Pool C runners up Argentina on 18 October 2015. Ireland battled and came back from a 17-point deficit to come within 3 points of their opponents, but a series of mistakes spelt the end for Ireland's RWC of 2015. Ireland have qualified automatically for the Rugby World Cup 2019 in Japan. They are in pool A along with the hosts, Japan, Scotland, Russia and Samoa. The winner of pool A will play the runner up of pool B and the runner up of pool A playing the winner of pool B in the quarterfinals. Below is table of the representative rugby matches played by an Ireland national XV at test level up until 10 March 2019. On 16 January, Joe Schmidt announced a 38-man squad for the 2019 Six Nations Championship. Three uncapped players were included in the squad, all from Connacht: scrum-half Caolin Blade, fly-half Jack Carty and centre Tom Farrell. This squad was altered throughout the course of the competition with players dropping in and out due to injury. Twelve former Ireland players have been inducted into the World Rugby Hall of Fame. The Hall was created in 2006 as the IRB Hall of Fame when the sport's governing body of World Rugby was known as the International Rugby Board. The separate International Rugby Hall of Fame, which had inducted five Ireland players, was merged into the IRB Hall in 2014, shortly before the IRB adopted its current name of World Rugby. All International Hall members who had not been separately inducted to the IRB Hall automatically became members of the renamed World Rugby Hall. Jack Kyle was inducted in 2008, followed by Willie John McBride, Syd Millar and Tony O'Reilly in 2009; Mike Gibson in 2011; Ronnie Dawson in 2013; Keith Wood in 2014; Tom Kiernan, Fergus Slattery Basil Maclear in 2015; Brian O'Driscoll in 2016; and Ronan O'Gara in 2018. Five players have represented Ireland in 100 tests or more: Brian O'Driscoll with 133 caps, Ronan O'Gara with 128, Paul O'Connell with 108, John Hayes with 105 and Rory Best with 101. Including Lions caps, O'Driscoll has 141 caps (2nd highest in rugby), O'Gara has 130, O'Connell has 115, Hayes has 107 and Best 100. O'Gara also holds the Ireland record for test points with 1,083, placing him fourth all-time in international rugby. He also holds the record for highest points scorer in the Six Nations with 557. O'Driscoll has scored 46 tries for Ireland – an Irish record. The following Ireland players have represented the British and Irish Lions. The IRFU first appointed a coach in 1968. The current head coach is Joe Schmidt who has been in the position since 2013. Ireland's end of year tests were by the BBC until 2013 before Sky Sports secured the rights. From November 2018 Channel 4 has the TV rights in the UK and RTÉ have the rights in Ireland. TV3 Ireland and BBC/ITV retain the 6 Nations rights and ITV and TV3 with Eir Sports have the rights to the Rugby World Cup. ^ Murray Kinsella (8 August 2015). "Ireland have moved up to second in the world rankings for the first time ever". the42.ie. Retrieved 8 August 2015. ^ "History of the Irish Rugby Football Union". IRFU.ie. Irish Rugby Football Union. Retrieved 9 April 2015. ^ "Irish International Teams: Results, Scorers, Dates and Venues – 1874 to June 1999". Irishrugby.ie. Retrieved 31 October 2008. ^ Editor (19 October 2011). "Connacht Gear Up For Launch Of New Kits : Irish Rugby | Official Website". Irishrugby.ie. Retrieved 8 February 2014. ^ Frank Keating (27 February 2007). "How Ravenhill rebels made an issue out of an anthem". The Guardian. UK. Retrieved 31 October 2008. ^ Orders, Mark (19 February 2018). "When the Wales rugby team faced 'death threats' in Ireland". walesonline. Retrieved 15 May 2018. ^ "The day England won a Lansdowne ovation". The Irish Times. Retrieved 15 May 2018. ^ "O'Sullivan quits as Ireland coach". BBC Sport. 19 March 2008. Retrieved 20 March 2008. ^ "2009 Six Nations". BBC Sport. 22 March 2009. Retrieved 22 March 2009. ^ "Wales 15–17 Ireland". RTÉ Sport. 21 March 2009. Archived from the original on 22 March 2009. Retrieved 23 March 2009. ^ "Ten out of ten: Ireland's unbeaten 2009 in rugby". www.irishtimes.com. 3 December 2009. Retrieved 10 March 2018. ^ "Ireland 20–23 Scotland". BBC Sport. 20 March 2010. Retrieved 20 March 2010. ^ "O'Driscoll sets all-time try record". The Sydney Morning Herald. 19 March 2011. Retrieved 15 May 2018. ^ "2012 Six Nations: England 30–9 Ireland". BBC Sport. 17 March 2012. Retrieved 18 March 2012. ^ "Ireland End Tour With Heavy Loss". irishrugby.ie. 23 June 2012. Archived from the original on 28 June 2012. Retrieved 23 June 2012. ^ "Penalties Decide It As Ireland Lose Brutal Contest". irishrugby.ie. 10 February 2013. Archived from the original on 12 February 2013. Retrieved 10 February 2013. ^ "Six Nations 2013: Italy 22-15 Ireland". BBC Sport. 16 March 2013. Retrieved 2 April 2013. ^ a b "IRFU Announce Joe Schmidt As Ireland Coach". irishrugby.ie. 29 April 2013. Archived from the original on 1 May 2013. Retrieved 29 April 2013. ^ "Last-Minute Try Denies Ireland Historic Win". irishrugby.ie. 24 November 2013. Archived from the original on 27 November 2013. Retrieved 25 November 2013. ^ "Terrific Display Sees Ireland Dominate Wales". irishrugby.ie. 8 February 2014. Retrieved 8 February 2014. ^ "England edge Ireland in war of attrition to end our Grand Slam dreams". independent.ie. 22 February 2014. Retrieved 4 March 2014. ^ "O'Driscoll signs off in style in Dublin". rbs6nations.com. Retrieved 17 March 2014. ^ "Ireland win 2014 RBS 6 Nations in Paris thriller". rbs6nations.com. Retrieved 17 March 2014. ^ "How history was made as Ireland beat New Zealand". 7 November 2016. Retrieved 1 December 2016. ^ "The perfect Grand Slam: Schmidt's Ireland in All Black territory after ruthlessly securing Six Nations clean sweep". Irish Independent. 19 March 2018. Retrieved 21 March 2018. ^ "How does 2018 Grand Slam compare to delirium of 2009?". RTE Sport. 19 March 2018. Retrieved 21 March 2018. ^ "Jacob Stockdale scores only try as Ireland earn historic win over All Blacks". Guardian. 17 November 2018. Retrieved 19 November 2018. ^ "Canterbury Announced As New Kit Sponsors To IRFU". irishrugby.ie. 27 January 2014. Archived from the original on 29 January 2014. Retrieved 28 January 2014. ^ "Ireland's Call". BBC News. 29 October 2002. Retrieved 8 February 2007. ^ "Ireland Anthem". planet-rugby.com. 18 May 2001. Archived from the original on 29 September 2007. Retrieved 8 February 2007. ^ "Rugby bosses reject unionists' anthem argument". BreakingNews.ie. 21 August 2006. Retrieved 8 February 2007. ^ "SA to play in Aviva rugby opener". BBC Sport. 8 October 2009. Retrieved 12 October 2009. ^ "Ireland 32–17 Namibia". BBC Sport. 9 September 2007. Retrieved 23 March 2010. ^ "Ireland 14–10 Georgia". BBC Sport. 15 September 2007. Retrieved 23 March 2010. ^ "France 25–3 Ireland". BBC Sport. 21 September 2007. Retrieved 23 March 2010. 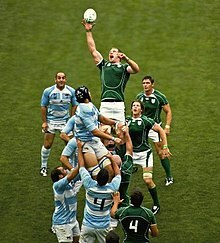 ^ "Argentina 30–15 Ireland". BBC Sport. 30 September 2007. Retrieved 23 March 2010. ^ "Rugby World Cup 2011: Ireland 22–10 USA". BBC Sport. 11 September 2011. Retrieved 11 September 2011. ^ "Rugby World Cup 2011: Australia 6–15 Ireland". BBC Sport. 17 September 2011. Retrieved 17 September 2011. ^ "Rugby World Cup 2011: Ireland 62–12 Russia". BBC Sport. 25 September 2011. Retrieved 25 September 2011. ^ "Rugby World Cup 2011: Ireland 36–6 Italy". BBC Sport. 2 October 2011. Retrieved 2 October 2011. ^ "Rugby World Cup 2011: Wales 22–10 Ireland". BBC Sport. 8 October 2011. Retrieved 8 October 2011. ^ "Rugby World Cup 2015: Ireland 50-7 Canada". RugbyWorldCup.com Sport. 19 September 2015. Retrieved 19 September 2015. ^ "Rugby World Cup 2015: RWC 2015 breaks another record at Wembley Stadium". RugbyWorldCup.com Sport. 27 September 2015. Retrieved 27 September 2015. ^ "Rugby World Cup 2015: Ireland 44-10 Romania". RugbyWorldCup.com Sport. 27 September 2015. Retrieved 27 September 2015. ^ "Rugby World Cup 2015: Ireland 16-9 Italy". RugbyWorldCup.com Sport. 4 October 2015. Retrieved 4 October 2015. ^ "Rugby World Cup 2015: Ireland 24–9 France". BBC Sport. 11 October 2015. Retrieved 11 October 2015. ^ "Injury ends Paul O'Connell's Ireland career". RTÉ Sport. 13 October 2015. Retrieved 13 October 2015. ^ "Rugby Union - ESPN Scrum - Statsguru - Test matches - Team records". espnscrum. Archived from the original on 29 November 2014. Retrieved 18 November 2014. ^ "Ireland Men's Team". Irish Rugby. Retrieved 18 April 2019. ^ "IRB Hall of Fame Welcomes Five Inductees". International Rugby Board. 23 November 2008. Archived from the original on 23 February 2009. Retrieved 23 November 2008. ^ "IRB Hall of Fame: The 2009 Induction" (PDF) (Press release). International Rugby Board. 27 October 2009. Archived from the original (PDF) on 16 May 2011. Retrieved 28 October 2009. ^ "Mike Gibson inducted into IRB Hall of Fame" (Press release). International Rugby Board. 11 May 2011. Archived from the original on 13 May 2011. Retrieved 24 May 2011. ^ "Dawson Inducted Into IRB Hall Of Fame" (Press release). Irish Rugby Football Union. 19 November 2013. Archived from the original on 2 December 2013. Retrieved 19 November 2013. ^ "Inductees: Keith Wood". World Rugby Hall of Fame. Retrieved 26 April 2017. ^ "Inductees: Tom Kiernan". World Rugby Hall of Fame. Retrieved 26 April 2017. ^ "Inductees: Fergus Slattery". World Rugby Hall of Fame. Retrieved 26 April 2017. ^ "Inductees: Basil Maclear". World Rugby Hall of Fame. Retrieved 26 April 2017. ^ "Inductees: Brian O'Driscoll". World Rugby Hall of Fame. Retrieved 26 April 2017. ^ "Ronan O'Gara inducted into World Rugby's Hall of Fame". The 42. 12 September 2018. Retrieved 13 September 2018. ^ SFMS Limited. "Statsguru: Ireland player appearances records". ESPN Scrum. Archived from the original on 12 October 2013. Retrieved 8 February 2014. ^ SFMS Limited (2 October 2011). "Stasguru Overall Points Record". ESPN Scrum. Archived from the original on 11 August 2011. Retrieved 2 October 2011. ^ SFMS Limited. "Six Nations: Total Points Scored". ESPN Scrum. Archived from the original on 18 March 2012. Retrieved 25 January 2012. ^ SFMS Limited. "Brian O'Driscoll Stats". ESPN Scrum. Retrieved 25 January 2012. ^ "Les Kiss Takes over Ireland". Espnscrum.com. Retrieved 8 February 2014. ^ "Irish Rugby". irishrugby.ie. Retrieved 24 July 2017. Wikimedia Commons has media related to Ireland national rugby union team.